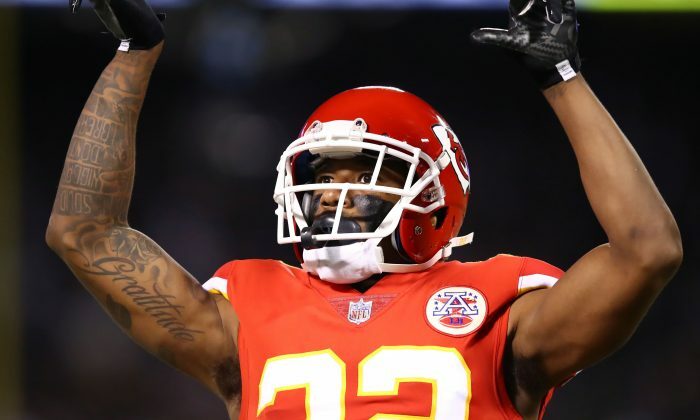 Kansas City Chiefs cornerback Marcus Peters exited after he threw a referee’s penalty flag into the stands. A lucky fan apparently caught it—during the fourth quarter of Sunday’s game against the New York Jets. The Chiefs were penalized for defensive holding on a Jets’ crucial 2-point conversion play late in the fourth quarter as New York was up 36-31 over the Chiefs. Peters then picked up the flag and threw it into the MetLife Stadium stands. The cornerback left the field after the play but he wasn’t ejected for the move. Peters later returned to the field without wearing socks, as the CBS commentators noted. The Chiefs ultimately lost 38-31. It’s unclear if the NFL will take action against Peters after reviewing his conduct.